This example illustrates the concept of the core number of a vertex. Mathematically, the core number of a vertex v is the largest integer c such that v has degree > 0 when all vertices of degree < c are removed. Equivalently, the core number of vertex v is the largest integer c such that v exists in a graph where all degrees are at least c.
The beauty of core-numbers is that they arey very intuitive to compute and understand. Let's load some data. This graph comes from the paper with the O(m) algorithm to compute the core numbers of an undirected graph by Batagelj and Zaversnik, "An O(m) algorithm for the cores decomposition of a network." By inspection, vertex 16 is in a 0 core because it has no edges in the graph. From the statement of the property, let's figure out the core numbers for this graph. For each possible degree d, let's remove all vertices with degree <= d and degree>0 and repeat this until there are no vertices with degree (0,d]. Then, any vertex that is left, must have core number at least d+1. The following code implements that algorithm where the graph Ad is the current working version of the graph. At the end of the for loop, the graph Ad is the graph A where all vertices of degree <= d have been removed. The output shows us that vertex 16 is the only vertex with a core number of 0. Because this graph is an example, "it just so happens" that the cores make a nice picture. 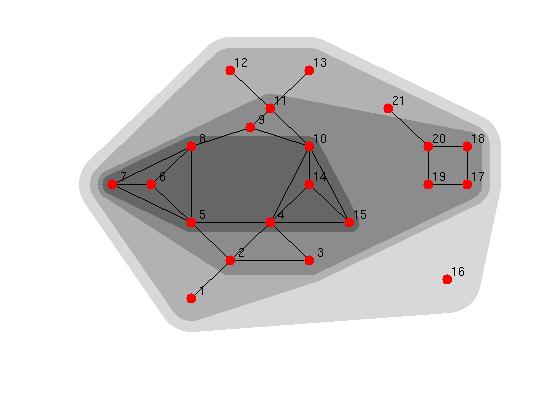 The following code plots the convex hull around the points inside of a k-core. The darker the color, the higher the core. The figure shows the 0-core, the 1-core, the 2-core and the 3-core. Although vertex 11 has degree 5, it is only a 2-core vertex because it links to two 1-core vertices. Also, note that the cores aren't necessarily connected components. The 2-core contains two connected components (2-11,14-15) and (17-20). The MatlabBGL function core_numbers implements efficient algorithms to compute the cores of a graph. These algorithms are significantly more efficient than the previous code and produce identical output. Let's check that they produce the same output. For fun, let's see how many cores there are in a road network. 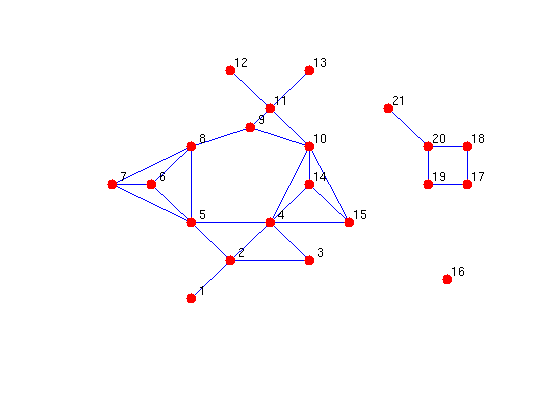 Vertices in a 1-core in a road network have at least one path between them (assuming the underlying network is connected). Vertices in a 2-core have at least two paths between them. % we compute the core nubmers again. The highest core is still two! I think that's pretty amazing. There aren't subnetworks of the Minnesota highways where you always have at least three choices at every intersection.